Announcements are great, but sometimes they don’t give you the full picture. What if you had a question about something that wasn't answered? What if you want to hear more about something that was mentioned but didn't get much attention? For all of this (and eventually more) I'm happy to announce that we've launched the official Cantata forums! 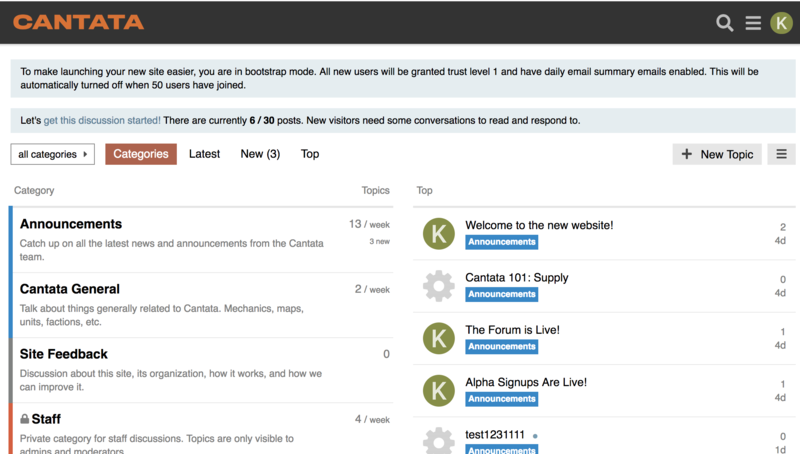 It feels weird to be excited about launching a forum in 2019 because forums have been around forever, but, for Cantata, they feel right. We want the game to be a game that people not only play, but one that they have the ability to engage with on a strategic level. Forums are great for this, with people sharing tactics and maneuvers that push at the bounds of the game's systems. Additionally, Cantata has robust modding support built in, and I wanted a place where people could openly share their creations with others. I've got some other ideas planned around this specifically, but hope that in its early days you join us to just hang out and talk the game in general. The forums right now is limited to two Categories, "Announcements" and "General". Any new announcement posted on the site will automatically get its own thread in "Announcements" on the forum. Comments on the forum thread will then appear on the site as well, so people just visiting the site can see what people are talking about with regards to that specific announcement. "General" for now is the other category, meant to capture all things Cantata until there is more of the game to actually play. We'll obviously add Categories like "Technical Support" and "Modding" once those items come, but for now feel free to ask anything about the game in the "General" category. Once the alpha launches and you get the game in your hands, I'm excited to watch what for now is a simple comments portal and general group turn into a thriving location for people to make, create, and share together. Working on a cool mod? Post it in the forum! Looking for collaborators? Post it! Need some design feedback? Upload your test mod and see what other people think. I'm really excited for all of what's possible in the future, but for now ask that you join in and come say hello.